The saga of Faraday Future is full of weird twists and turns—and the last several weeks for the company have been no different. 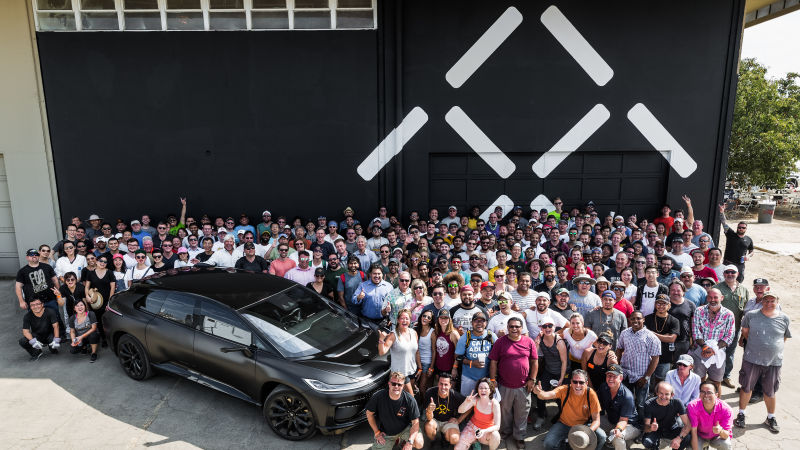 In the last month alone, FF has reportedly taken steps to prepare to file for bankruptcy, and has also scaled back its product plans from six vehicles to just one, the futuristic electric autonomous FF 91. But according to FF, nothing’s changed. And more weirdly, the company says the bankruptcy “plan” wasn’t created at all by FF. The company’s still in the process of focusing its efforts on completing the FF 91, officials said, and finishing a new manufacturing facility in California. At the same time, Jia Yueting—the face of the startup and its main financier—is battling accusations that FF’s parent company in China committed fraud during a 2010 fundraising effort. More on that in a minute. Rumors of a possible bankruptcy reemerged last month in Chinese media, after a purposed document outlining plans for a Chapter 11 restructuring began to circulate among several new outlets. Based on the dates of the document (which you can see here), it appears it would’ve been created sometime over the summer, when FF was trying to raise $1 billion. “The company will likely be required to file Chapter 11 bankruptcy by the middle of August 2017 as raising fresh capital within this time frame remains unlikely,” the alleged document says. The intention, according to the document, was to raise $150 million in conjunction with the bankruptcy filing, and then new investors would pay an additional $130 million to settle claims with “outstanding creditors” and then, by November, take control of the company. The idea of FF preparing to enter bankruptcy court isn’t particularly shocking. By all accounts, the company hadn’t been able to secure investors for the $1 billion fundraising round. (Sources said investors have come to the table, but keeping Jia in the picture was a nonstarter. Jia, the sources said, has refused to step aside.) There’s probably an argument to be made that it could benefit from a bankruptcy. But here’s the thing—FF says the documents aren’t legitimate. “These documents were not created by Faraday Future, nor were they created on behalf of Faraday Future or at Faraday Future’s request,” a spokesperson for Faraday Future told Jalopnik. It’s a very, very unusual situation. Taking FF at its word, that means someone took the time to piece together a very detailed, very specific PowerPoint presentation that outlined specific remedies in bankruptcy court and how the company would be transferred to new ownership. What benefit does someone have to manufacture a false document like this? To spite FF or Jia? If someone would actually go that far to mess with the company as it’s trying to raise money, isn’t that, perhaps, an indictment in and of itself of the company’s top brass? Nevertheless, Faraday says any discussion of a possible bankruptcy isn’t based in reality. “We can confirm that any bankruptcy rumors are false, that the company has not filed for bankruptcy protection, and that we continue to meet with potential partners interested in investing in FF,” the spokesperson said. Beyond that, Faraday Future is no longer planning a product line-up of six vehicles, said Sam Fiorani, Vice President of global vehicle forecasting for AutoForecast Solutions, an auto consulting firm. Though the company wouldn’t directly respond to Fiorani’s statements, it reiterated that it’s focused on five main objectives, beyond finishing the FF 91 and the California factory: preparing sales infrastructure in the U.S., supporting a team in China on the development of a second vehicle, and supporting the development of a new factory in China. Faraday previously backed away from a plan to build a $1 billion factory in Nevada in July. Separately (at least somewhat), Jia’s having to deal with accusations that Leshi committed fraud when it filed an initial public offering in 2010 and raised $110 million. Xie Zhongping and Sun Xiaobo, two lawyers previously hired by the China Securities Regulatory Commission (CSRC) to review and approve IPOs on the start-up board ChiNext, are now under investigation for alleged dereliction in assessing the listing application by Leshi, according to two sources close to the CSRC. Neither lawyer could be reached while the regulator would not comment on Wednesday. Leshi raised 730 million yuan in mid-2010 through an IPO, amid allegations that its earnings and operating details had been inflated. Remarkably, with people related to the matter detained and amid accusations that his former company committed fraud, Jia’s speaking out. In an interview with a news program owned by Tencent Holdings, Jia denied there was any issue with Leshi’s IPO, and the individuals who were detained had no role in preparing the fundraising effort. Among the several former members of China Securities Regulatory Commission (CSRC) who were detained, only three were in charge of IPO-related issues for Leshi Internet Information & Technology Corp, a listed arm of LeEco, and were not under investigation because of Leshi’s IPO, Jia told Lengjing, an investigative financial news program owned by Tencent Holdings. In November 2016, Li Liang, former head of the CSRC’s investor protection department, was accused of graft totaling 6.94 million yuan ($1.05 million) for helping nine companies, including Leshi, in their IPOs, Lengjing reported. “It’s not related to Leshi,” Jia said, emphasizing that Leshi did not falsify its IPO documents. Jia reportedly said in the interview that he believes Faraday’s financial situation will improve within the next few months. The fundraising round to raise a fresh $1 billion? No progress to report, he said. One particular quote stands out from the interview. Faraday’s business plan of the last two years—huge glitzy presentations to unveil cars, a build out of a $1 billion factory, a rapid-fast timeframe from conception to the launch of production—has been a sore spot for the company, as it tries to refine itself amid very pronounced financial struggles. Now, Jia says, its failure—so far—is a reflection of problems in that corporate strategy itself. It’s an incredible admission.